As many Fluid readers know, the cocktail bar scene in London is hot, hot, hot and showing no signs of slowing down. From the gin craze started a couple of years ago, to tequila and Scotch, cocktail lovers are spoiled for choice in our fair city. As such, it's no surprise that more and more drink brands are keen to dip a toe into this world of liquor. The latest spirit I have come across is Cognac. Now, to me, Cognac has always been a "sip by the side of a fire" kind of a drink; something you have on cold winter nights once you reach your twilight years. But, with a new bottle design - the first since the 1920s - Cognac leader Remy Martin is trying to put its feet firmly in the cocktail camp. In order to find out what they are all about, I recently headed over to the Savoy Hotel’s American Bar where bartender Swanand Korgaonkar whipped up some tasty treats for my eager self. Swanand has worked at the Savoy since 2003, before the hotel’s and Remy Martin's respective makeovers. He told me he likes to use Remy Martin because he has been to the distillery in the Cognac region and was impressed by the company’s commitment to the product. Swanand knows all about that; he has an exuberant passion for cocktails and their development. 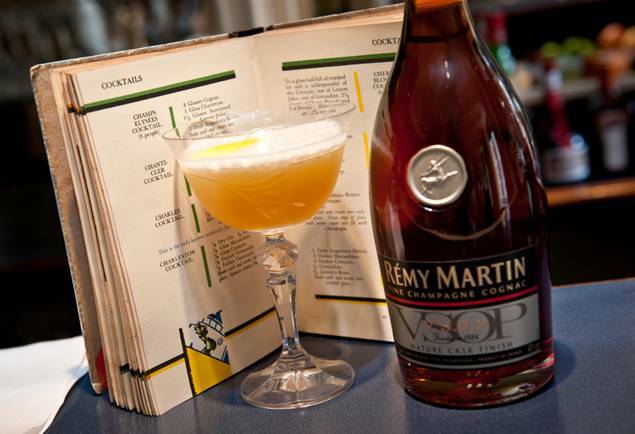 We started out with a Champs Elysee - a recipe for which is below - which he delicately made with Chartreuse, Remy Martin VSOP, homemade sours and Angostura bitters. It was rich but perfectly balanced between sweet and sour, the Cognac coming through right at the end with a burst. But my favourite was one of Swanand’s own creations called the Colly, which has won him many a cocktail competition and which will soon be appearing on the menu at the American Bar. Made from a mix of bright saffron, smooth cognac, sharp lemon, agave syrup, quince liquor and Peychaud’s bitters (and a dash of love and passion, according to Swanand), this is a whopper of a drink. It’s one for sipping after a long day with your favourite friends, while you relax in the grandeur of 1920s style that is the American Bar. After a few drinks, it was evident I was becoming more convinced of using Remy Martin in cocktails. The company is doing a lot right now to move into this market, even creating a cold Cognac machine, called the Remy Iceboxx, which dispenses one perfectly chilled shot of VSOP for partygoers. I think, Fluid Londoners, you may just see a new liquor taking a spot at the front of the cocktail queue, but only time will tell. If you'd like to learn more about cocktails, wines and Champagne, click here for a guide to classes in London.